Gurgaon: Lancers International School has become Gurgaon’s first educational institution to be included in the IARC’Centre for United Nations chapter. The move will expose students of Lancers International School to plethora of extra-curricular activities such as United Nations- led Olympiads,global UN activities through the school chapter, volunteer opportunities in UN initiatives related organizations and an opportunity to implement UN initiatives on campus.It will also offer the privilege to students to avail benefit of certification courses based on Agenda and Focus Areas of Centre for UN. It will also help students to comprehend their course curriculum better and gain an international perspective of their courses of study. Crescent University,Chennai, Aligarh Muslim University, Aligarh,Bharti Vidhyapeeth University, Pune, Punjabi University, Patiala and KIIT University, Bhubaneswarare among other educational institutions that are a part of Centre for United Nations chapter. 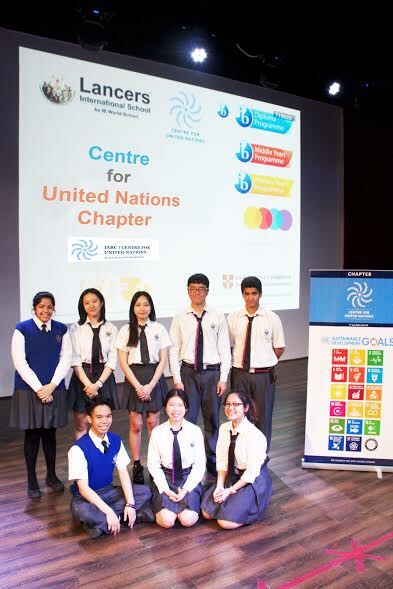 “Lancer International School is proud to be a part of Centre for United Nations chapter. Our institution strongly believes in the UN agenda for peace and sustainable development and is looking forward to champion actively for the cause,” said Mr. Rohit Mann, Director, Lancers International School. As a member of Centre for United Nations Chapter,Lancers International School would be authorized to conduct activities such as lectures, panel discussions, film screenings and the like. The school would also have access to MY United Nations portal which is a repository for research and promotional material related to Agenda and Focus Areas of Centre for UN. Utkarsh Mehta, the Project Head (International) for IARC’ Centre for UN Chapters said, “We congratulate Lancers International School management’s visionary decision of bringing international UN initiatives to their students through the Centre for UN chapter. This is how we will realize the UN agenda of Creating the Future We Want in India and the world”. The initiative would also offer host of benefits to chief mentors and chief coordinators of Center for United Nations Chapter. It will enable chief mentors to hold a key position in any international campaign and contribute to policy-making to United Nations. Similarly, Chief Coordinator will be entitled to hold a key position in school and gain exposure to the working of UN and other international agencies. Centre for United Nations is listed as a major group organization with UNCSD. Its agenda is closely aligned with UNGA declaration A/RES/66/288, Sustainable Development Goals and Paris Agreement. Its focus areas include sustainable energy, sustainable development, gender justice, ecology and environment, climate change to name a few.